Thanks to Facebook, Flickr, Twitter, and a host of other social media services, people are more connected than ever. But keeping up with all the tweets, posts, and status updates isn't easy, because they often come from a variety of social media sites. So how do you connect the different services that keep you connected? How do you steer all of that stuff to one spot on the Web where it's a snap to manage? New tools called social media aggregators have risen to address that challenge. Their goal: to provide you with one simple point of entry where you can keep track of the streams from any and all of the most popular social networking sites. A bunch of social media aggregators (or "life-streaming" tools, as they're sometimes called) have shown up in recent years, but some social media services don't always do the job you need them to do. Here’s a look at the three that, in our estimation, fulfill the promise of social media aggregation most completely: Streamy, Flock, and FriendFeed. Streamy is a Web site designed to collect not just all of your favorite social media sites but also blogs and instant messaging tools, putting them into one self-contained dashboard. The first time you log in to Streamy, you won’t see much of consequence--that’s because you need to link your services with Streamy first. Click on the Setup link on the top left, and you’ll see nine different services to choose from, ranging from Facebook and Twitter to Digg, Flickr, and even FriendFeed. The Streamy Status Update tool can post updates to Facebook, Twitter, or any other social service you add--or even to all of them in one fell swoop. Unlike Flock and FriendFeed, Streamy doesn’t pull all of your separate social sites into a single, aggregated river of social updates. Instead it keeps each service in a separate “tab,” which you can access by clicking on the icon for each service. The nice thing about this arrangement is that Streamy allows you to customize each service with advanced layouts and widgets to keep up with custom searches (in Flickr or Twitter, for example) or tagged photos or events (in Facebook). As such, Streamy doesn’t merely act as a dashboard for all of your social media sites; it also allows you to create a custom dashboard for every site, offering a heads-up view of what’s going on at each individual site based on what’s important to you. 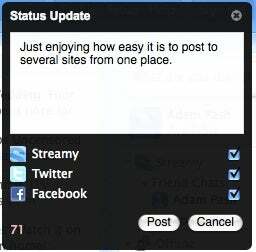 Finally, Streamy makes it easy to post a status update to all of your sites in one fell swoop: You simply click the 'What are you doing?' status box that’s always visible on the right side of the page and tick the check box of each service where you want your update to post. Unlike the other two tools discussed here, both of which are Web services, Flock is a desktop application. In fact, Flock is a full-fledged Web browser, built from the same open-source code that powers the popular Firefox browser. Click on any individual social media service icon in the People sidebar for a quick overview of what's happening at that particular site. Getting Flock up and running with your favorite services is simple. The first time you open Flock, it will prompt you to log in to supported social sites. Once you log in to a service, Flock can automatically add that service to your People sidebar (click on the Remember Account drop-down). This People sidebar is where Flock shines. Each time you log in to a new supported account, that account appears in the People sidebar. From there, you can click on any of the account icons to see each service individually, or you can click on the All button to see every status update from all of your services aggregated into one chronological feed. You can even post updates to supported sites directly from the People sidebar. If you have a particular affinity for Facebook, Flock’s FlockCast feature can even post any action you undertake on one of your other social sites--such as uploading new pictures to Flickr--directly to your Facebook account. 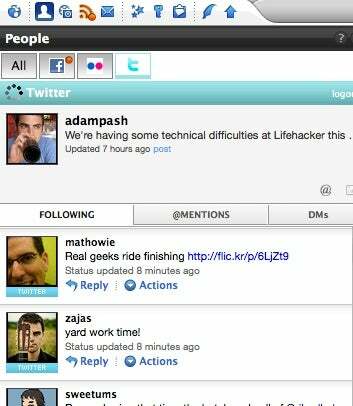 The Flock People sidebar displays a single stream of all your favorite social services. Also, since Flock is not Web-based, you can access your aggregated social media via Flock only on computers where you can download and install the application, meaning you’ll be out of luck on most public and some work computers. FriendFeed was one of the first social media aggregators to hit the scene in a big way. 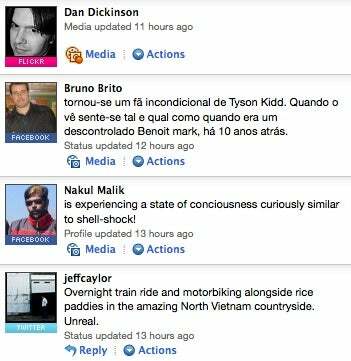 Founded by a handful of former Google employees, FriendFeed consolidates social updates from 58 services (at the time of this writing), from Facebook and Twitter to Google Reader, Last.fm, and even Netflix (letting your buddies know what movies you’ve queued). FriendFeed looks and feels a lot like Twitter, except it integrates all of your social activity in one place; you can even post to Twitter at the same time you post to FriendFeed. In stark contrast to the other two offerings compared here, which pull your friends’ activity directly from your social sites into a centralized tool, FriendFeed focuses more on you, allowing you to pull all of your social output into one central location. That is, rather than providing you with a single place to keep track your buddies' output, the first thing FriendFeed does is provide your friends with a single place to keep track of you. For example, FriendFeed can aggregate all of your tweets, Facebook status updates, and even posts from your blog, so rather than your trying to update all of your social sites every time you do something on the Web, your friends can just subscribe to your FriendFeed to see all of your updates in one place, no matter where you’ve posted them. As an added bonus, your friends don’t have to go looking for you every time you start a new account somewhere, since presumably you’d add any new social accounts to your FriendFeed. FriendFeed supports an impressively large group of social services. FriendFeed is laid out a lot like Twitter, but instead of showing just tweets, it collects everything you do online (or at least everything you do on a connected service). If you really like the FriendFeed interface, you can post updates to FriendFeed and Twitter simultaneously from your home page. As an added bonus, when you follow people on FriendFeed, you get access to all of their updates in real time--you don’t even have to refresh your browser. Next: Which Aggregator Is for You?